In the late eighties we were introduced to Michael Abbott who became our UK agent, a real gentleman and one of these few without whom we wouldn’t be around making gilt leather any longer. Shortly after we met, Michael introduced us to a famous Pimlico Road antiques dealer and decorator, the man himself a nonchalant, laid-back, aristocratic aura. The showroom, loaded with a mix of unusual objects and top antiques, a harmonious, calculated, masculine chaos. All things I like. To me an interior has to have the three A’s, Antiques Art Architecture without these its … complicated to make something interesting, imposing or even joyful. Imposing as I believe one becomes humble and relax in the presence a genial mix of the three A’s. We were asked to reproduce a design which he had in his archives, having agreed on terms we went happily to work. Once the mould ready, cast in bronze and impossible to handle. The modest production started. It was the first time we set eyes on this design, but than again there are so many designs dating from this period. And research in these days was …..well different, not with the click of the mouse ! When supplied, part of the panels were used to line the walls of the showroom window. No pictures available, yet for us something never to forget. Working on the archive material provided by our client we noted some irregularities in the background ornament, so far so good. Later we came across this design as it appeared in an article about a restoration of the ancient gilt leather of the Deanery in Zele Belgium a small town nearby our hometown Ghent. Remarkable here is that this design was issued by one gild leather workshop, as we know that some designs were produced by almost all the gilt leather workshops. The quality of the work makes this workshop a good one, this also is to be noted as some workshops were not very much regarding to the quality of their work. At the end of the day the question that remains is where was this design produced. Two locations in the UK against one in Flanders do not tell the story. One thing is for sure, the workshop produced quality leathers. The reproductions made for the eccentric antiques dealer ? Made in Ghent, Flanders. Hanging onto his paint brush on his shaky scaffold. Without Wiebren this project would not have seen daylight. the last remodeling was around 1750. It always amazes me to see buildings this old in such good condition, typical northern Europe ! The more you wander to the south the quicker buildings seem to wear. Our place dates form 1850 and was sort of a ruin already. the flowers were painted in the 18th century tradition. The leathers painted and hanging to dry before the antiquing is applied. The colours and the gilding were made to the customers specifications. Dutch professional magazine Eisma’s published an editorial on the subject. It shows the trimming and gluing of the leathers. A rare opportunity to practice your Dutch…. The indisputable proof that hanging the leathers is easy and fun ! A link to Wiebren Dijkstra ‘s site. Japanese Gilded Screen, the making of an Utopia. A place of peace and harmony. Storms are roaring yet only to be impressively beautiful. This world, so remote form the one we are living in is a widespread ideal found in many cultures and religions throughout the ages. The Japanese created a mobile, temporary, in the here and now space “Utopia” by surrounding a confined space in a room, in a house or outside the house with gilded screens. Within this confined area reigns harmony. This to say that both articles are must read. “” As anyone familiar with art fairs or auction houses knows, art is a potent social tool. Almost magically, ownership bestows status, turns nobodies into somebodies and makes those somebodies look classy and smart or, at the very least, rich. Yes, art is about ideals and beauty and all that. But it is also about the power of possession, the sovereignty of taste. Deep down, it appeals to the royalist in us all. This is one way to talk about ”Golden Fantasies: Japanese Screens From New York Collections,” a small but splendiferous show at the Asia Society and Museum consisting of eight painted and gilded folding screens and a few related objects. And with their taut surfaces, they were natural and versatile vehicles for painting. Screens intended for formal or official settings might use images to project moral or political messages, while others designed for domestic quarters might carry scenes of leisurely pursuits and sensual pleasure. Large screens or pairs of screens could accommodate panoramic landscapes and narratives, as is the case in the Asia Society show, organized by Rosina Buckland, a doctoral student at the Institute of Fine Arts, New York University. The screens on view, all but one on loan from private collections, date from the 16th and 17th centuries, when a feudal Japan was undergoing jolting change. By that time imperial rule, centered in Kyoto, had long been supervised, if not entirely usurped, by shoguns, members of an ambitious military elite who acquired the cultural credibility required of leadership by patronizing and collecting art. They did so at a time when aesthetic trends changed often and fast. Chinese styles were the measure of painterly refinement during the Muromachi era (1333-1573). But in the brief Momoyama period (1573-1615), lavishly baroque and astringently minimalist strains of art developed side by side. The end of the Momoyama brought further social developments. Urban culture flowered in the new capital city of Edo, present-day Tokyo. In that elbows-rubbing environment, rigid class hierarchies enforced by military rulers loosened up. Wealth, once generated by heredity or conquest, was increasingly concentrated in the hands of a bourgeois merchant class. We have printed the metallic foil on vegetal leather panels, the metallic ground thus obtained was afterwards varnished with a natural lacquer. 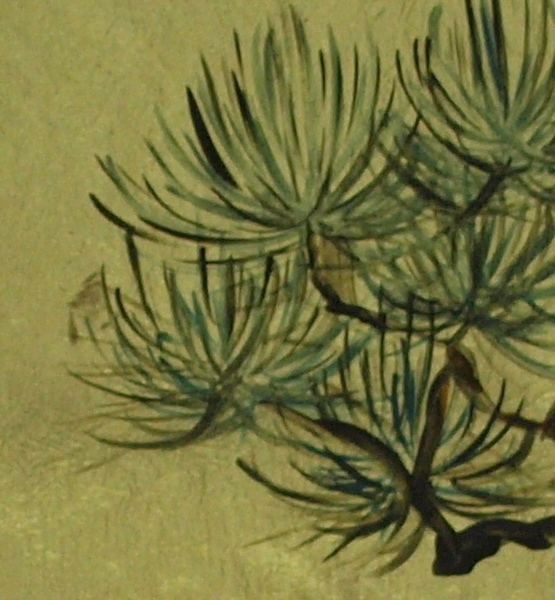 The Pine Tree which symbolizes Purity is painted with artist oil colors. Knowing that 18th century gilt leather was often used in Japanese culture we thought it a good idea to revive this cultural interchange complete The Flemish technique and the Flemish artistic hand, here combined with refined Japanese design.